The amygdala is an almond-shaped part of the brain that plays important roles in autonomic, unconscious functions as well as in memory formation, learning, and emotions such as fear. The amygdalae are located in the temporal lobe of the brain and are part of the basal ganglia—an important component of the limbic system. The amygdalae consist primarily of clusters of neurons and contain several nuclei, including the basolateral complex, the medial nucleus, the cortical nucleus, and the central nucleus. There is one amygdala on each side of the brain. There are minor differences between the functioning of the left and right amygdalae. The right amygdala is involved primarily with negative emotions, while the left amygdala is involved in both negative and positive emotions. Despite its small size, the amygdala plays an important role in many basic functions. The amygdala communicates with the hypothalamus, and these signals help regulate the sympathetic nervous system. 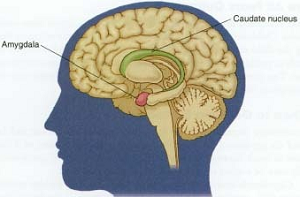 The amygdala also plays a central role in memory. Emotionally charged events are more easily remembered, and this is partially due to the role of the amygdala, which connects emotion to memory. The amygdala is especially important in the development of fear, and reflexive fear reactions are due in part of the functioning of the amygdala. The amygdala also enables the brain to transform short-term memories into long-term memories, a process called memory consolidation. People with damaged amygdalae may have difficulty with emotion-based learning and memory. The amygdala may also play a role in social skills because of its role in learning, memory, and emotion. A few studies have shown that people with larger amygdalae tended to have larger and more active social circles. Some other studies have implicated the amygdala in aggressive behavior, alcoholism, binge drinking, and sexual orientation. goodtherapy.org…is a great learning website..I use it all the time! Hello Jean, I believe your great-niece does have something more else going on. It sounds a bit autistic, and a serious case of separation anxiety! Since the last I spoke about my great niece, she has made some changes. I heard her say some words real quietly clear words, but low voice. She has detached from mom but when she can be occupied. She is busy getting into everything. She is busy. My niece also told me that she gives her children all organic foods too. I asked my niece what has the doctor said about your daughter. My niece says the same thing she’s growing good. I’m like … I’m a behavioral health worker and a teacher of 15 years early child hood. I’ve seen and helped so many children received help on disorders or diseases. I don’t credit from all family members just my brothers 2 of them. Any suggestions to getting my niece to at least look into a development specialist like her doctor should be implementing..?